Featuring stylish rooms in Singapore’s financial district, M Hotel is a convenient 5-minute walk from Tanjong Pagar MRT Station. It pampers guests with a pool and spa with hydrotherapy treatments. 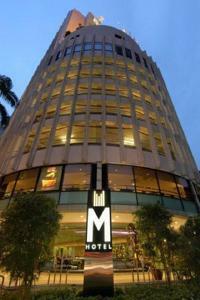 Hotel M is a 5-minute walk from Lau Pa Sat Food Center, where local dining delights can be enjoyed. Chinatown is a 15-minute walk away, while VivoCity Shopping Center is a 5-minute ride from the hotel. Rooms at M Hotel feature a workstation and flat-screen TV with cable channels. Laptop safes and tea/coffee makers are provided. Private bathrooms feature a separate shower and bathtub. Guests of the hotel receive free private parking privileges. For a good work out, guests can head to the well-equipped fitness center, which features a rock climbing wall. The hotel also features an extensive business center. Cafe 2000 serves Western and Asian specialties, while international cuisine can be enjoyed at The Buffet. For Japanese delights, guests can head to Hokkaido Sushi Restaurant. Drinks are served at J Bar. Rooms: Hotel Rooms: 413, Hotel Chain: Millennium Hotels. Wired internet is available in the hotel rooms and costs SGD 35 per 24 hours. Free! All children under 11 years stay free of charge when using existing beds. Free! All children under 2 years stay free of charge for baby beds. All older children or adults are charged SGD 80 per person per night for extra beds. The maximum number of extra beds/baby beds in a room is 1. Any type of extra bed or crib is upon request and needs to be confirmed by management. Supplements are not calculated automatically in the total costs and will have to be paid for separately when checking out.